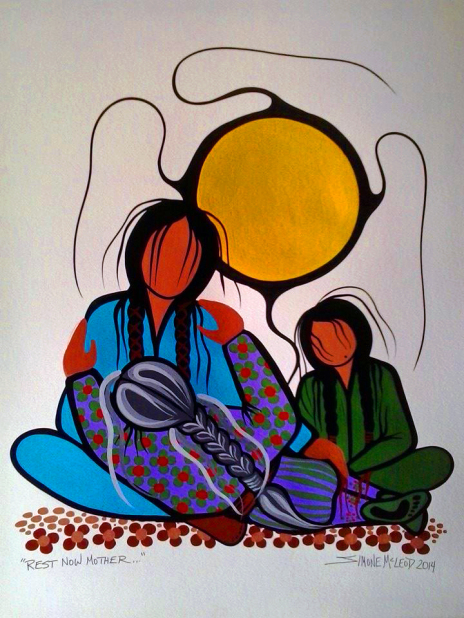 This painting is a loving tribute to my mother and all grandmothers of our Nations. "Our moms are not just mothers"
When we are children they are these magical creatures who seem to get things done. When we are youths, they're always around to make us feel like "we're okay man". When young adults, we think often of just how inadequate they truly are, somehow we find ways to secretly blame our mothers for everything going wrong in our lives. As we mature, and learn to take responsibility for our own bad choices, we see them as the very real people they are. They are somebody's child, they had the same needs and wants we had and they tried hard to give to us everything they could. My heart bursts with love when I think of my small beautiful mother standing with seven little kids against the world. She did her best. (Her partner has no right being in this thought because he was not a loving normal person.) She had her own dreams. Her own expectations of life. Her own preferences for a perfect man even. She had her own heart. As a mother and as a daughter, I think of her often now that some of my decisions in life have paralleled hers, there were so many things she wanted to do but never did. I appreciate her sacrifices so much now. I see the selfishness that she endured most of her life because it was her way. Omg! I know I'm going to mess up my life too!!! But I'm okay with it. She taught me a lot even when she wasn't teaching me. I'm proud to be her daughter!